As fall creeps in, the risk of a deer-vehicle accidents greatly increases. Deer-vehicle collisions are actually three times more likely to occur on a day in November than they are on any day between February 1 and August 31. Deer collisions typically happen from sunset to midnight and in the hours before and after sunrise. Be especially alert during these times. 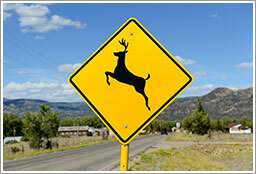 Drive carefully through areas with high deer populations and deer crossing zones. Deer typically travel in numbers, so where you see one, there are likely others. When traveling at night, use your high beams whenever possible. If you see deer, slow down and blow your horn to frighten them away. Stay in your lane and brake firmly. Many deer-related accidents are caused by one car hitting another while attempting to avoid an animal. Do not rely on deer whistles to repel deer. For additional resources, contact a Knowledge Broker at R&R Insurance. Drive safely!